We’re partway through Pink October and here’s something I got in the mail I thought I might share. The Pantai Group of Hospitals has launched a Breast Cancer Awareness programme called Think Pink! to create awareness among the public through activities conducted at various avenues through the Think Pink! @ Workplace, Think Pink! @ Streets, Think Pink! @ Online and Think Pink! @ Hospitals throughout October. Other than those activities, there will also be a limited edition T-shirt that comes with a goody bag with vouchers and products from sponsors like Tanamera Spa, Celebrity Fitness, Baskin Robbins etc. The T-shirts are sold to raise funds for the breast cancer related non-government organizations (NGOs) which are the Breast Cancer Welfare Association (BCWA) Malaysia, PRIDE Foundation and Pink Unity (an NGO affiliated with the National Cancer Society). 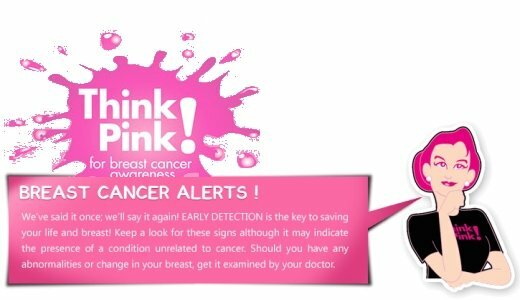 For more information, including what events will be held where, and how to perform a breast self-examination and what warning signs you should look out for, please go to the Pantai Holdings Think Pink website here.